Type your text in a bold font of your choice and apply Filter --> Blur --> Gaussian Blur with a radius of something like 3. Hit CTRL-E to merge down the layers. Duplicate your layer and select the upper layer. Apply Filter --> Pixelate --> Mosaic and set the Cell Size to 9 or 10, depending on the size of your text. Now set the layer's opacity to 50 percent and use Filter --> Sharpen --> Sharpen three or four times. Press CTRL-E again to merge the layers. 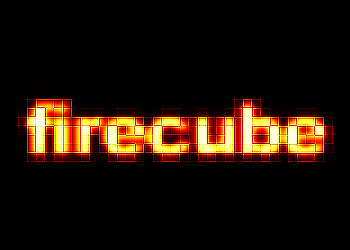 Alright.. fire cube text done!